The article describes the CIFE awards 2012, how Academic and College Award winners are chosen, the awards ceremony proceedings, and the individual 2012 award winners' achievements and backgrounds. 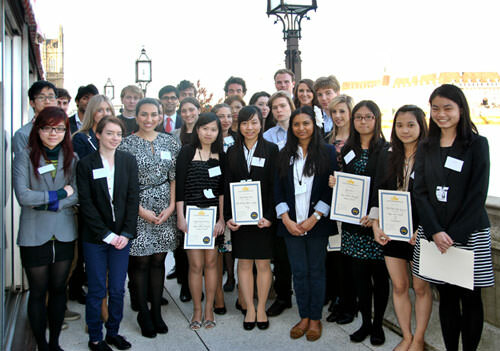 At the annual CIFE Academic Awards Presentation held at the House of Lords on Monday 19th March 2012, Baroness Perry of Southwark presented awards for excellence to more than thirty CIFE college students. 18 students received CIFE Academic Awards for outstanding A-level results, one for GCSE and one for Foundation courses. Competition for Awards is fierce: perfect module scores and national ranking exam performance are usually needed! An additional 13 students received College Awards. Individual CIFE colleges can make an award to the student whose all-round contribution to college life has been exceptional. The Gold Award winner, Poppy Waskett, an A-level student at Lansdowne College, overcame three years of ill health to achieve three A*s after only one year's study. She is now reading Experimental Psychology at Oxford University. She said: “I was lucky to have a lot of people around me to encourage me (and remind me when I needed a break! ): my teachers, my friends and my mum. My January results were an important foundation, not just for my marks but for my confidence. When I faced the exams in June, I was in the more comfortable position of having a bit of faith that I could obtain the results I needed to fulfil the conditions of my Oxford offer.”. 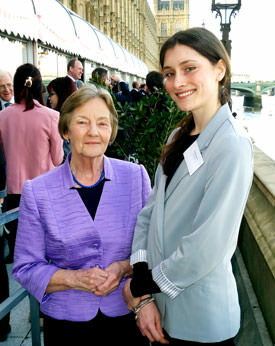 Poppy is pictured with Baroness Perry. Baroness Perry, former Chief Inspector of Schools, is the Honorary President of the Council For Independent Education (CIFE). She said: "It is a great pleasure to celebrate the wonderful achievement not only of these outstanding young people, but also their parents for supporting them, and all their teachers and colleges. They have achieved astonishingly good results and my congratulations go to them all." The 2012 CIFE Award winners are pictured above. This, the top honour, went to Poppy Waskett, of Lansdowne College.